The definition of vacation, according to Wikipedia, is “a specific trip or journey, usually for the purpose of recreation or tourism.” It usually carries the idea of relaxation and a break from work. My idea of a perfect vacation is quiet, sleep, and possibly a beach: mostly sleep, though. That’s not the kind of vacation that I usually get; ours usually involves a lot of travel. This past week, we added over 3,000 miles to our odometer. That’s 3,000 miles with two little boys who don’t like to sit. Relaxing? Not really. Fun? Definitely. Everything is what you make it. The hardest part of taking a trip for me is the planning phase. I’ve gotten much better at organizing what I need to do and when I need to do it, making packing lists and cooking preparations. When you travel on a special diet, the usual amount of time preparing for a road trip triples — or maybe more. For me, the mental stress of thinking that “if I fail to prepare well for the trip, my children will go hungry” used to be overwhelming. I ended up cooking for days ahead of time, having way too much food, and tossing a third of it because it spoiled. This trip was different. When you follow the GAPS diet, you know how important it is to have fresh home-cooked food, lots of healing broths, and fats. How do you incorporate “home cooking” into a road trip? It’s difficult. An ideal way to make it work is to make sure you stay at places where you can cook. Last year, we spent about 5 or 6 days up in the Porcupine Mountains in the upper peninsula of Michigan. We found a reasonable little condo where it included a kitchen, stove, and fridge; this was wonderful in terms of food preparation. Also, for kids on the autism spectrum, this can be better than spending each night in a different hotel. Coming back to the same place to stay each night gives them a sense of routine and stability. But unfortunately, this trip did not involve staying in one place. We visited 10 states in 9 days, saw over 5 national and state parks, drove up 14,110 feet to the top of Pike’s Peak, and stayed with two friends along the way. The longest stay in one place was 2 days. So, on this type of vacation, how do you stay GAPS? Preparation. This time, I decided not to do a lot of cooking ahead of time so that things would not go bad. Prepackaged “legal” foods and fresh fruits and fermented veggies keep a lot better than things made ahead of time out of nut flours. I also looked around for restaurants that may serve legal foods along the way, along with searching for cities with Whole Foods and local health food stores. This proved to be a huge lifesaver. My stress level went down considerably knowing I only needed to pack enough of some foods to last a couple days, that we wouldn’t run out of food on our trip, and that we didn’t need to eat cold meats and hardboiled eggs for every meal for 9 days. I usually do not have too much vacation time banked up at work, so how I get time off is by working a bunch of days before and after a stretch of days off. For this vacation, I worked 4 12-hour night shifts prior to leaving on our trip, and I am in the middle of working another long stretch of night shifts now that we’re back. The problem with this is that I really need to plan well, as I got off work Tuesday morning and we were planning to leave early Wednesday morning and drive 14 hours on that first day. Making lists ahead of time is huge for me, because when I’m in a sleep-deprived state, my memory and planning skills are not the best, and something is bound to be missed. Things missed = stress. So, I had all my lists made ahead of time. Monday morning after work I went and got groceries. I put the cold things in the fridge and then slept for a few hours before getting up, making the beef jerky and a few other things, and then went back to work Monday night for 12 hours. Then Tuesday when I got home, I slept a couple hours, and started preparation. Broth (I make ours out of chicken and let it simmer down until it makes a nice gelatin. Then I keep it in our cooler in a glass mason jar, without worrying that it will spill). I had about six different restaurants across the Midwest and Rocky Mountain areas that seemed like they may offer some food that was GAPS safe. Because of the times we were travelling, sleeping kids or just wanting to get to the next pit stop, we only ended up going to two of these. But having the option to stop and have a hot meal was nice, whether we used that option or not. 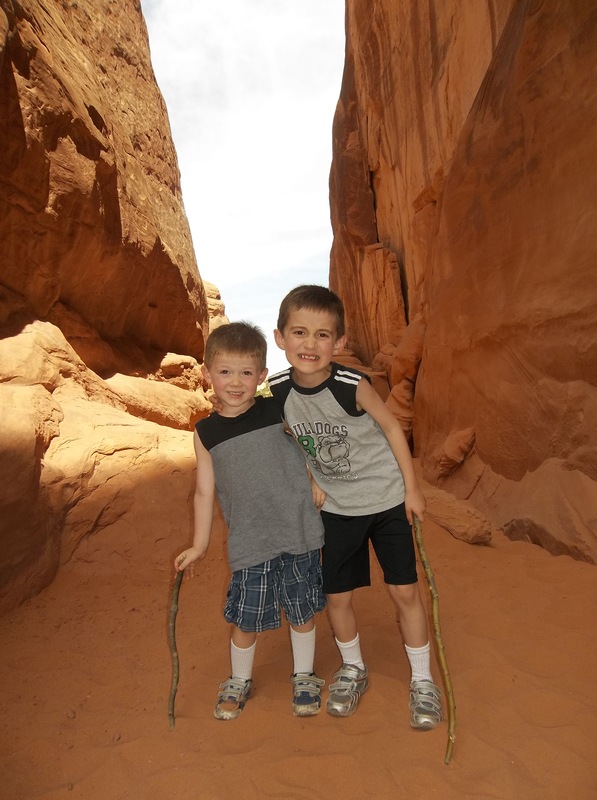 The first place we visited was in Moab, Utah. Moab is down by the Arches National Park and the Canyonlands National Park. There was a little place called “Peace Tree Juice Café“. There we were able to get hamburgers that had no additional ingredients added, some veggies, and freshly squeezed juice. The fruits and veggies were not all organic, but we were able to avoid the “dirty dozen”. The food was good, the service was OK. In a pinch, it was a nice place to visit. The best part was that around the outside courtyard, a constant light mist was blowing, which in the middle of the desert feels great! The other place we visited was in Des Moines, Iowa; we stopped there on the day we were travelling back home. It was called “New World Café“. We were able to find things on the menu that were GAPS acceptable (I loved their salad), but it felt a little odd being there as they are a vegan café, with much information and pamphlets about animal cruelty and an anti-carnivorous lifestyle, and here we were, being the omnivores that we are. 🙂 My oldest son liked the food (he likes food in general), but my little carnivore ate only a few bites. We restocked a couple of times along the way at Whole Foods, first in Salt Lake City and then in Colorado Springs. We were able to also find things in the buffet and the deli area at Whole Foods in Colorado Springs that were GAPS legal, which made very happy little boys. For a nine day trip cross-country, we were well fed, and we were able to enjoy the beauty of nature around us without worrying whether we were sticking to our diet or not. This is something that can be hard to do when you’re following a special diet, but it is also necessary. Your life should not be ruled by your diet. The less stress that you experience in life, the quicker your body can heal. Keeping positive and enjoying life is vital. This is something that can be easier said than done; I often find myself struggling to keep a positive attitude and reduce stress. So, if you decide to try the GAPS diet, know that even a road trip is possible on GAPS. Not only possible, but fun too! UPDATE: For an updated version of “Traveling on the GAPS Diet”, visit here. This new post includes lists of foods to bring, how to plan if you are traveling by plane or automobile, if you have a kitchen that you can use, or if you are staying in hotels. It also discusses several non-food GAPS items to include in your suitcase! Love your choice of pictures for this post! I found a couple other pictures that were pretty witty too, but didn’t get a chance to include them. It’s amazing what things you see on a road trip! Thanks so much for checking out my blog, Vanessa!